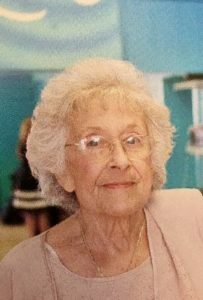 Concetta (Connie) Patti, age 88, passed away at her home in Manahawkin, NJ on Tuesday, January 16, 2018. She was born on January 3, 1930 to Philip and Bridget Fontana in Brooklyn, NY. Connie was the “girl next door” and caught the eye of her neighbor, Joseph Patti. They were wed on April 12, 1953 and happily married for 65 years. Together, they had two sons: Joseph and Philip. Raising her children was what gave Connie purpose in life because she was a woman that loved with all of her heart, but she was also a woman who liked to stay busy. She worked for many years as a receptionist for Safest Driving School in the Bath Beach section of Brooklyn, NY. Ironically, she never learned to drive but loved to have her husband chauffeur her around. She loved her job because she loved to socialize and meet new people. There wasn’t a person who knew Connie that didn’t say she was full of life and energy. She was very much a people person. Her family defined Connie’s life and seeing them happy brought her such joy. When it came to her two sons Joseph and Philip, there was nothing she wouldn’t do for them, but her grandchildren (Joseph, Nicholas, Philip, Michele, Jillian, and the late James Patti) and her great grandsons (Giuseppe and Enzo) were her world. She buried treasures in her yard so her grandchildren could dig them up years later. At Christmas, if there was a toy that was hard to find, that didn’t deter Connie. She was a very determined woman and if they wanted it, you could be sure they would get it! Connie was also a loving mother-in-law and role model to her two daughter-in-laws: Susan and Myrna. She went to the ends of the Earth for those she loved. Connie was a very generous woman and she expressed her love through her cooking. A meal wasn’t just a meal for Connie Patti. It was a feast. No one left the table hungry and each meal was more memorable than the last. Connie will always be remembered as a spirited woman whose light burned brightly for 88 years. She was a lamp lighter who led the way for those who were lucky enough to know and be loved by her. She is now in the arms of the Lord and in the arms of her grandson, James, and we pray that she is at peace.